As most us know, the triple-screw steamer Titanic, and her sister ship Olympic, were propelled by a combined machinery arrangement consisting of two reciprocating engines and a single Parsons’ turbine. The reciprocating engines were of the triple-expansion type with one high-pressure cylinder, one intermediate-pressure cylinder, and two low-pressure cylinders. 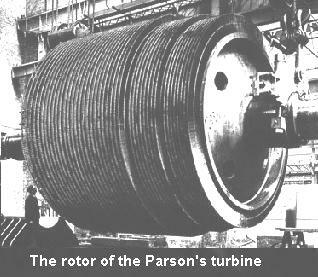 The Parsons’ turbine, which was fed by exhaust steam from the reciprocating engines, was a low-pressure reaction type. Each reciprocating engine drove one 3-bladed wing propeller of 23½ feet diameter, one on the port side of the vessel, and the other on the starboard side of the vessel. The turbine engine drove a central propeller of 16.5 feet diameter located on the ship’s centerline directly ahead of the rudder. The reciprocating engines were designed for 15,000 indicated horsepower (IHP) each when running at 75 revolutions per minute. The turbine was designed to develop about 16,000 shaft horsepower (SHP) when running at 165 revolutions per minute. At those numbers of revolutions, the ship was expected to make 21 knots. Titanic’s propelling machinery was registered at 50,000 horsepower. Standard “normal full revolutions” in service was considered to be 78 revolutions per minute for a speed a little over 22½ knots. When running ahead at 83 revolutions per minute on her reciprocating engines, the entire power plant would develop about 59,000 horsepower, of which 18,000 horsepower would be contributed by the turbine. When carrying those number of revolutions, the ship would have made close to 24 knots through the water. The arrangement of the propulsion and power generating plants for these ships are shown in the diagram below. The aft most compartment is the turbine engine room that contained the Parsons’ low-pressure turbine, thrust blocks for the propeller shafts of the reciprocating engines, and the ship’s two main condensers that turned exhaust steam back into boiler feedwater. Ahead of that compartment was the reciprocating engine room with the two reciprocating engines, the feedwater heaters, the ship’s refrigeration plant, and other auxiliary equipment. Ahead of the engine rooms were six separate boiler rooms and 11 stokeholds. All of these compartments were separated from each other by transverse watertight bulkheads and protected by automatic drop-down watertight doors. Steam was generated in Titanic’s boiler rooms located just ahead of the engine rooms on the tank top level just above the ship’s keel. The ship carried 24 double-ended Scotch boilers, each 15 feet 9 inches in diameter and 20 feet long with 6 furnaces, three on each end. The ship also carried 5 single-ended auxiliary boilers, also 15 feet 9 inches in diameter but only 11 feet 9 inches long with three furnaces each. Although these single-ended boilers could also be hooked up to the ship’s main steam supply lines, they were generally used to power the ship’s electric generating plant and other auxiliary engines while the ship was in port. The total heating surface of Titanic’s boiler plant was 144,142 square-feet with a grate surface of 3,466 square-feet. All of the boilers were constructed in accordance with the rules of the Board of Trade for a working pressure of 215 pounds-per-square-inch (psi), and were tested to a pressure of 430 psi. They were arranged for working under natural draught conditions, assisted by fans that blew air into the open stokeholds. With the reciprocating engines running at 75 revolutions per minute and 24 double-ended boilers hooked up, a supply rate of just over 260 lbs of steam per minute per boiler would be produced. 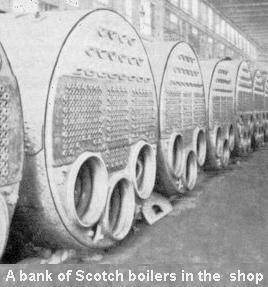 The Scotch marine fire-tube boilers such as the ones used on the Titanic contained a large quantity of water and took a long time to bring it up to pressure. Typically, it took almost 12 hours from the time one of these boilers were lit until it could brought on line at a working pressure of 215 lbs per square inch. 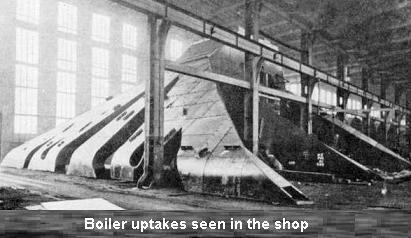 A bank of these boilers is shown in the photograph below. The three furnaces at the end of a Scotch boiler were in the form of corrugated fire-tubes. Each furnace terminated in a combustion chamber surrounded by water. From the combustion chamber the hot gases from the burning coals passed through a bank of relatively small fire-tubes surrounded by water to the smoke uptake box on the front face of the boiler. In the double-ended boilers, overall space was saved since furnaces on opposite ends shared the same combustion chamber. To prevent cold air hitting the combustion chamber’s opposite wall when a furnace door was opened, a baffle of firebrick was typically installed in the middle of the chamber. The diagram below shows a schematic of one of these double-ended Scotch boilers viewed from the side. The boiler rooms, also called sections, were numbered 1 through 6. Boiler Room (BR) No. 1 was just ahead of the reciprocating engine room and contained the five auxiliary single-ended boilers. When lit, these boilers would be fired from stokehold No. 1 at the forward end of the room. No. 2 boiler room was forward of No.1 and contained 5 double-ended boilers. The furnaces facing aft were fired from stokehold No. 2 and those forward were fired from stokehold No. 3. Ahead of BR No. 2 was BR No. 3 also with 5 double-ended boilers that were fired from stokeholds 4 and 5, respectively. Similarly, ahead of BR No. 3 was BR No. 4 with stokeholds 6 and 7, and ahead of that was BR No. 5 with stokeholds 8 and 9. Ahead of BR No. 5 was BR No. 6 with stokeholds 10 and 11. However, due to the narrowing of the hull as we approached the bow, BR No. 6 contained only 4 double-ended boilers instead of the usual 5. The Titanic had four elliptical-shaped funnels, but only the three forward funnels were used to take up the waste gases from the six boiler rooms. The funnel elliptical cross section measured 24 feet 6 inches by 19 feet 0 inches. Their average height above the casing was about 70 feet. The uptakes by which the waste gases were conveyed to these funnels were united immediately above the watertight bulkheads which separated boiler rooms No. 1 and 2 (J), No. 3 and 4 (G), and No. 5 and 6 (E). The aft most of the three forward funnels with boiler uptakes, the ship’s third funnel, had a transverse baffle in its lower end that divided the funnel between boiler rooms No. 1 and No. 2. This was in the portion between the top of the boiler uptakes and the top of the funnel casing. The aft side of the funnel, serving No. 1 boiler room, had 5 individual flues each serving a single-ended boiler; while the forward side, serving boiler room No. 2, had two flues that were offset to port with each serving one of the two port-side double-ended boilers that could be operated separately there. A large single combined starboard-side flue served the other three double-ended boilers in BR No. 2. The ship’s second funnel also had a transverse baffle in its lower end that divided it between boiler rooms No. 3 and No. 4. In this case, the aft side of the funnel, serving No. 3 boiler room, had a combined flue serving all 5 double-ended boilers in that room. The forward side, serving No. 4 boiler room, had 2 flues that were offset to starboard with each serving one of the two starboard-side double-ended boilers that could be operated separately there. A large single port-side flue served the other 3 double-ended boilers in BR 4. The foremost funnel had only a single transverse division that separated boiler room No. 5 from boiler room No. 6, each served by a single combined flue. The baffling was eliminated in stages as the temperature of the gases dropped. Initially, there was baffling that divided each bundle of smoke tubes from the next within the same boiler end. Then there were separate uptake trunks from each boiler end. Then, once these merge, interior baffles divided each boiler from the next, and one boiler room from the next up to the top of the uptakes. Then, in the lower part of the funnel, a transverse baffle dividing one boiler room from the other plus the additional baffling as noted above for the single-ended boilers and those double-ended boilers that could be connected separately to the auxiliary steam supply line. The visible part of the funnel above the casing had a single, non-divided inner flue which vented all the gases from the two boiler rooms that it served. For use at sea, there were automatic ash ejectors equipped in boiler rooms No. 2 through No. 6, the boiler rooms that contained the double-ended boilers. These were recessed into the coal bunkers one located on the port side and the other located on the starboard side in one of the section’s stokeholds. The specific locations of these automatic ash ejectors on the Titanic were: BR No. 2 in stokehold 2, BR No. 3 in stokehold 4, BR No. 4 in stokehold 7, BR No. 5 in stokehold 8, and BR No. 6 in stokehold 10. These ash ejectors were worked from a duplex feed pump located in a small pump room located off the ship’s centerline and recessed into the aft port-side coal bunker in boiler rooms No. 2, 3, 5 and 6. In BR No.4, the pump room was recessed into the aft starboard-side bunker since the recess in the aft port-side bunker was used as a store space. To remove the ash, a trimmer would wheel it in a barrow to the nearest ash ejector where he would dump it into a hopper. From there the ash would be carried by a water jet up an inclined pipe and ejected well clear of the ship above the waterline. For port use, four ash hoists were used to lift the ash in canvas bags to small rooms on E deck called “ash places” for later disposal. These were located at the aft starboard side of BR No. 2, the aft port side of BR No. 3, the forward starboard side of BR No. 4, and the aft port side of BR No. 6. Each boiler room was separated from another by a transverse watertight bulkhead (WTB) that ran as high as E deck 11 feet above the ship’s load waterline. The coal bunkers feeding the stokeholds were arranged transversely on both sides of these watertight bulkheads, and a watertight passage through the bunker space on the tank top level to starboard of the ship’s centerline allowed access from one section to another and was protected by a drop-down watertight door (WTD). These watertight doors, as well as all the others on the tank-top level, could be dropped by throwing a single switch on the ship’s navigating bridge, or locally by a hand lever located near each door, or automatically by a float under the floor plates should a compartment get flooded accidentally. Steam from the boiler rooms was carried by two main steam pipes which passed through the watertight bulkheads to the reciprocating engine room. Shut-off valves were located at three of these bulkheads, including the one at bulkhead K going into the engine room. This was a quick-acting, balanced emergency valve fitted on each main steam pipe so that the steam could at once be shut off in case of a rupture in either one of the main pipes. On the after side of this bulkhead in the engine room were the main steam stop valves, 24-inches in diameter, each provided with a large separator and a cross connection. The separators were used in saturated steam lines to separate and remove any moisture formed because of heat losses. They worked by providing a series of changes in the direction of the steam flow and included a large surface area to intercept the droplets. The cross connection allowed either range of piping to be used for either or both engines. The main stop valves were operated by hand wheels and screws from the starting platform which was situated in the center of the forward end of reciprocating engine room near the bottom. The Titanic’s coal bunkers were filled through coaling ports located just above F deck. Although the major bunker spaces ran transversely across the ship, they also filled some side space that ran longitudinally between decks F and G. The ship’s coal bunker capacity was over 6,600 long-tons, enough for 8 days of steaming at full speed. For the purpose of specifying bunker capacities, letter designations were given in the Harland & Wolff drawing office notebook. These spaces and their designations are shown in the figure below. 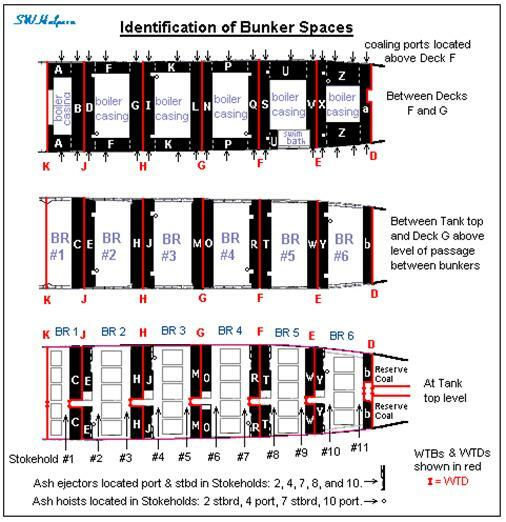 Also shown are the location of the watertight bulkheads and their letter designations, the locations of the watertight passages through the bunkers and their watertight doors on the tank-top level, ash ejector recesses and ash hoist locations, and the locations of the coaling ports on F deck. 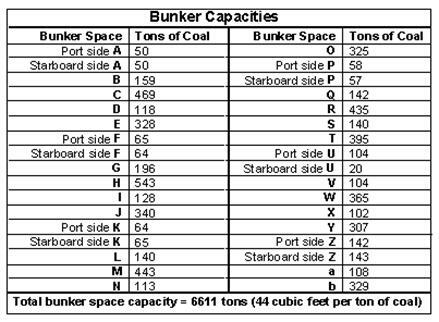 The capacities in tons of Titanic’s coal bunkers are given in the table below. 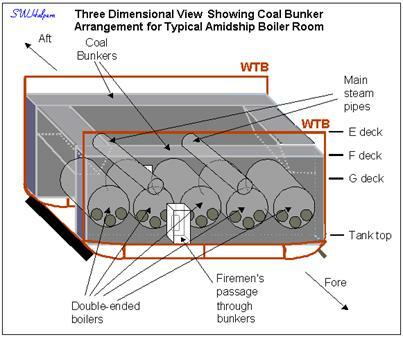 The simplified diagram below shows a typical midship boiler room with its bunker spaces. To work the 24 double-ended boilers while at sea during a four-hour watch period required 48 firemen, 20 trimmers, and 5 leading firemen, sometimes called leading stokers. Each boiler room required 4 trimmers to work the coal and carry the ash to the ejectors. That is because there were two stokeholds in each of these rooms, one forward and the other aft, and each stokehold had two bunkers to work, one to port and the other to starboard. To feed the boiler furnaces required from 8 to 10 firemen. One fireman was responsible for working one end of a given double-ended boiler. Thus 10 firemen were needed in boiler rooms No. 2 through No. 5 that had five double-ended boilers in each. In boiler room No. 6, with only four double-ended boilers, only 8 firemen were needed. The men in each of these double-ended boiler rooms were supervised by a leading fireman. If some of the double-ended boilers were not lit, the extra personnel in a watch section would be assigned other jobs like cleaning machinery, etc. Each of the six boiler rooms were equipped with an illuminated telegraph that received orders from a single transmitting telegraph located in the engine room. The illuminated colored orders read, from top to bottom, STOP (red), SLOW (blue), HALF (green), and FULL (white). 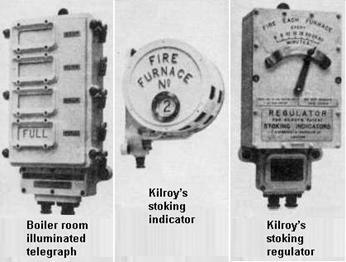 There was also a Kilroy’s stoking indicator equipped in each of the 11 stokeholds. These were controlled by two stoking regulators that were located in the engine room. The stoking indicator showed which of the three furnaces was to be fired at a given end of a boiler at a given time. Only one of the three furnaces on a given end would be opened at any time, and an arrangement was made on the stoking regulators so that corresponding furnaces on the other end of a double-ended boiler would never be opened at the same time. The stoking regulator set the time that each furnace was to be fired. It could be set to regulate the firing of the furnaces every 8, 9, 10, 12, 15, 20, 25, or 30 minutes, depending on how much steam was needed and the number of boilers that were connected up at any given time. The purpose of Titanic’s plant was to extract stored energy from coal and convert that energy into useful work used to move the ship, power equipment, heat and light living spaces, and refrigerate perishable food stores. For propelling the ship, the heat energy released from the burning of coal in the ship’s boilers was transferred into steam which was then sent to the ship’s engines where it was converted into mechanical work turning the ship’s propellers. As with other steam vessels of the time, Titanic’s power plant was a closed-loop thermodynamic system that took exhaust steam from the engines and condensed it back into fresh water, reheated it, and then feed it back to the boilers. A schematic of the entire power plant arrangement is shown below. High pressure saturated steam (red) from the boilers at 215 pounds-per-square-inch gauge pressure (psig) at 394° F is fed to the high-pressure (HP) cylinder on each reciprocating engine. Here the steam is expanded down to 78 psig at 322° F (yellow) and then fed to the intermediate-pressure (IP) cylinder where it is expanded down to 24 psig at 266° F (green). The steam at the output of the IP cylinder is then fed to a pair of low-pressure (LP) cylinders which further expanded the steam. The exhaust steam from the output of the LP cylinders from both reciprocating engines, now at 9 pounds-per-square-inch absolute (psia) pressure and 188° F (light blue), is then directed to changeover valves where it is led to the input of the Parsons’ reaction turbine. In the turbine the steam is further expanded down to 1 psia at 102° F (blue) where it is then delivered to a pair of surface condensers where the exhaust steam is condensed back into feedwater at a temperature of about 70° F (very dark blue). The two condensers had a combined cooling surface of 50,550 square-feet, and were designed to work under a vacuum of 28 inches with cooling water at 60° F. Four gunmetal centrifugal pumps (not shown in the schematic) were fitted for circulating sea water through these condensers. 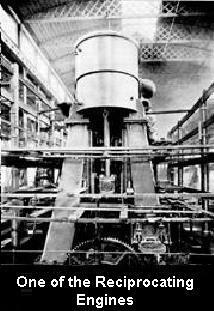 Each pump had suction and discharge pipes of 29 inches in diameter, and each pump was driven by a compound steam engine. On the Titanic and Olympic, the turbine engine was cut in only when the reciprocating engines were running ahead at half speed (50 revolutions per minute) or higher. During maneuvering operations or when going astern, the turbine would be bypassed as steam from the reciprocating engines would be redirected by the changeover valves to exhaust directly into the two main condensers. A pair of dual-type Weir's air pumps drew off the feedwater from each condenser as well as venting air and non-condensable gases to the atmosphere, exiting with the condenser circulating water discharge. The feed water was discharged from the air pumps through separate feed lines to two 2,790 gallon feed tanks, one placed on each side of the ship just abaft the bulkhead dividing the engine rooms. From the feed tanks, the water drained into two 48 cubic-foot hotwell tanks, one located on each side of the reciprocating engine room. From these tanks the feedwater was drawn off by two pairs of Weir hotwell pumps, one pair working each tank. From the hotwell pumps, the feed water was forced through two pairs of feedwater filters, which removed grease, lubricating oil and other contaminants. From the feed filters, the water flowed to a Weir "Uniflux" horizontal-surface feedwater heater located on the forward transverse bulkhead on the starboard side of the reciprocating engine room. Here the feedwater, still under the pressure from the hotwell pumps, flowed through the tubes of the heater. Meanwhile, exhaust steam at 5 psia from the four steam engines that ran the ship’s electric dynamos was passed through the shell and around the tubes of this surface heater where it was condensed by the cooler feedwater flowing inside the tubes. This heat exchange process raised the feedwater temperature from about 70° F to 140° F. A Weir's mono-type air pump handled the condensed steam from the dynamo engines that came out of the heater, adding this water to the feed supply. Still under the pressure from the hotwell pumps, the feedwater leaving the surface heater flowed upward to a Weir's direct contact heater located high up at the level of D deck at the ship’s centerline on the forward bulkhead of the reciprocating engine room. Here the feed water passed through a spring-loaded valve and entered the interior of this heater where it dropped through a conical dispersion plate causing it to fall in droplets through a cloud of exhaust steam that was admitted from the ship's many auxiliary engines that ran various pumps and the refrigeration equipment. This simultaneously raised the temperature of the feed water from 140° F to 230° F while condensing the incoming exhaust steam from the auxiliary engines and adding it to the feed supply. The direct contact heater also acted as the main controller for the return feed pumps by way of an internal float control that automatically regulated the steam supply to the feed pumps and the hotwell pumps, thereby causing these to work in unison. From the direct contact heater, the feedwater flowed down by gravity to four pairs of Weir's main feed pumps, two pairs being located at floor level on both sides of the forward end of the reciprocating engine room. The feed pumps supplied boiler feedwater through a set of feed mains to the various boiler rooms at a pressure greater than the working pressure of the boilers. These pumps were connected to the feed mains through valve chests which allowed any pump to feed any feedwater main. From there, the water was manually admitted to the boilers, the level being carefully maintained to keep the boiler tubes and furnaces submerged while maintaining the correct volume of space above the surface of the water for the production of steam. This entire process worked continuously as long as the main plant was in operation. There was a much smaller auxiliary condensing plant located on the starboard side of the reciprocating engine room which was used to handle the auxiliaries while the ship was in port. The ship was also equipped with a silent blow-off from the main steam pipeline for use as a "bleed line" to regulate the rise in steam pressure that would otherwise occur when the plant was put on stand-by and the fires banked. This was to prevent the safety valves from popping off which might otherwise occur. The silent blow-off connection was never used to "dump" a load of steam into the condensers. On Titanic they led a silent blow-off line from near the starboard side stop valve to the main LP outlet pipe of the starboard reciprocating engine. From there the steam was sent to the main starboard side condenser when the change-over valves were set as they would be with either the turbine or all main engines stopped. By first expanding the high-pressure, high-temperature steam in this massive outlet pipe, potential damage to the connections between the tubes and plates in the condenser that might otherwise occur was avoided. Despite being a close loop system, there were always some loss of feedwater supply. Additional fresh water for the boilers was carried in fresh-water tanks in the ship’s double bottom. These were located under the reciprocating and turbine engine rooms and had a total capacity of just over 1000 tons. Distilled fresh water could also be re-supplied from three evaporators located near the aft watertight bulkhead on the starboard side of the turbine engine room. If needed, each evaporator could produce 60 tons of fresh water every 24 hours. In addition to the main steam supply, there were separate steam connections to the pipe supplying steam to all the auxiliary machinery on board the ship. The auxiliary machinery included various pumps, the refrigeration machinery, the electrical plant, the steering engines, steam winches and ash hoists. The auxiliary steam supply came from the five single-ended boilers in BR No. 1, or from two port-side double-ended boilers in BR No. 2 and two starboard-side double-ended boilers in BR No. 4. This auxiliary steam pipe could also be cross connected to the main steam supply lines in the reciprocating engine room, thus receiving steam from any boiler in the ship. The ship had four main electric dynamos with a capacity of 400 kilowatts each. They produced 100 volts of direct current (DC). These dynamos, and the steam engines that drove them, were situated in a separate watertight compartment located aft of the turbine room. The 580 indicated horsepower steam engines that drove each dynamo were vertical, three-crank, compound engines with one HP and two LP cylinders. They ran at 325 revolutions per minute, and took in steam at 185 psig from two separate steam supply pipes to which they could be cross connected. One pipe was on the port side and was connected to the five single-ended boilers in BR No. 1 and with the two port-side double-ended boilers in BR No. 2. The other supply pipe, on the starboard side, was the auxiliary steam supply that was connected to the five single-ended boilers in BR No. 1, and to the two port-side double-ended boilers in No. 2, and the two starboard-side double-ended boilers in No. 4. In addition to these, there was a separate steam pipe leading to a pair of emergency dynamo engines situated on a platform 20 feet above the ship’s waterline on D deck on the aft side of the turbine engine room casing. These emergency dynamos produced 30 kilowatts of electric power each at 100 volts DC. These sets supplied power to 500 incandescent lamps fitted throughout all passenger, crew and machinery compartments, at the end of passages, near stairways, and on the Boat deck. There were also change-over switches that enabled 5 arc lamps, 7 cargo and gangway lamps, the ship’s navigation lights, the lights on the navigating bridge (including the wheelhouse and chart rooms), the Marconi apparatus, and 4 electrically-driven boat winches all to be connected up to this emergency circuit if needed. It was the practice to run these emergency dynamos every night after sunset in case of an accident to the main electrical supply during the night. Each emergency dynamo was driven at 380 revolutions per minute by a two-crank, compound engine with one HP and one LP cylinders. The emergency steam supply pipe that fed these engines ran along E deck above the watertight bulkheads and was arranged so it can take steam from the double-ended boilers in any of the three boiler rooms No. 2, 3, or 5. As a backup in case of accident to the main steam supply pipes, there was a connection that branched off of this emergency supply pipe to the pumps in the engine room that were connected to the bilges throughout the ship. There was also a cross connection to this pipe so that steam reaching the engine room from any boiler in the ship could be passed up to the emergency dynamos by opening two or three valves. 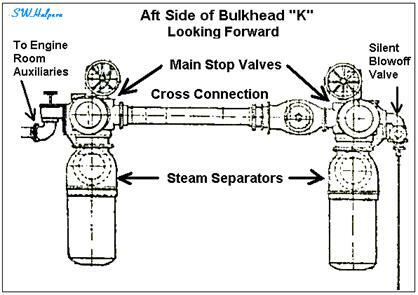 A schematic of the main and auxiliary steam supply is shown in the diagram below. Steam flow though Titanic’s reciprocating engines is shown in the diagram below along with some of the details of the reciprocating engine room. The engine cylinders, starting from forward and working aft, were low pressure, high pressure, intermediate pressure, and low pressure. In this arrangement, the low-pressure expansion stage was split between two smaller LP cylinders rather than having one very large LP cylinder. The combined effect of lower weight and four cranks on each engine shaft instead of three helped reduce overall vibration. The forward and aft LP cylinders on these engines both had two slide valves with two ports and a common chest. The twin slide valves of a given LP cylinder worked from the same cross-head by a single set of double bar links and eccentrics. The HP cylinder contained a single piston valve, and the IP cylinder contained two piston valves that worked similarly to the twin slide valves of the LP cylinders. Each set of links had its own separate adjustment to control the steam cutoff in the cylinders. These two reciprocating engines would present mirror images to each other as they both rotated in opposite directions when both were set to go ahead or astern. Looking forward, the starboard engine rotated clockwise and the port engine counter-clockwise when run ahead. The word "Inverted" refers to the fact that the cylinders are positioned above the crankshaft, a throwback to the early days of steam engines when the cylinders were located below the crankshaft. The term “double-acting” refers to the admission of steam alternately to both sides of a piston first pushing it up, then pushing it down. The process is shown in the simplified animation below. The term "triple-expansion" refers to the number of stages that the steam is worked through a particular engine. There are also “double-expansion,” or more commonly called “compound” engines, with only two stages of expansion, and "quadruple-expansion" engines which have 4 stages of expansion. All of these engine types have multiple pistons operating at different pressures driving a common crankshaft. Steam from the boilers was first admitted to the high pressure stage where it expands to a lower pressure as it forces the piston up and down. From this stage the steam is exhausted into a manifold and then to the inlet valve of another stage designed to operate at a lower pressure. Again power is produced as the steam does work on that piston and expands down to yet a lower pressure. This process continues through each stage until the steam exhausts from the final stage where it is sent to a condenser, or as in the case of the Olympic and Titanic, to a turbine engine where it is expanded down further extracting more work from the steam. The amount of work done by a reciprocating steam engine is shown by what is called an indicator diagram. 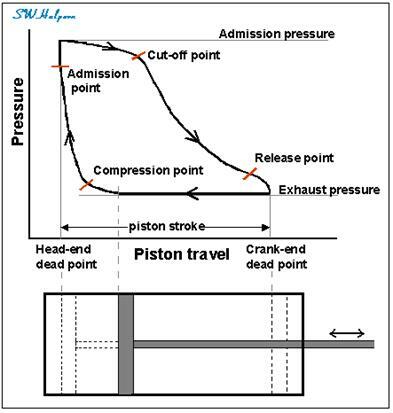 This traces out pressure Vs. piston travel (which is proportional to cylinder volume) during a complete engine cycle. The area enclosed by the diagram represents the amount of net work that is done on the face of a piston. Since these engines were double-acting, the total work done for one revolution of given cylinder is the sum of the work for both ends of that cylinder, or twice that shown on the diagram. For a triple-expansion engine, this must be done for each cylinder and the results added to get the total work done. A typical indicator diagram for a single cylinder is shown below. There are four key areas on the indicator diagram. The Admission point is where steam is first admitted to the cylinder, the Cut-off point is where steam is cut off from the cylinder and allowed to expand as the piston continues to move out, the Release point is where the expanded steam is first allowed to exit the exhaust port, and the Compression point is where the exhaust port is closed causing the remaining steam in the cylinder to be compressed to a higher pressure just before the admission point is reached again. The work done per revolution, the area within the diagram curve, multiplied by the revolutions per minute of the engine is an indication of the amount of power produced in the cylinder. According to White Star Line rules, it was the responsibility of the Chief Engineer to see that his staff were all familiar with the use of these Indicator diagrams, and that the indicated power taken from them was periodically compared with the expenditure of coal on board. A set of combined indicator diagrams plotted to a common scale of pressure and cylinder volumes for a triple-expansion steam engine using the working pressures that were used on the Titanic is shown in the figure below. 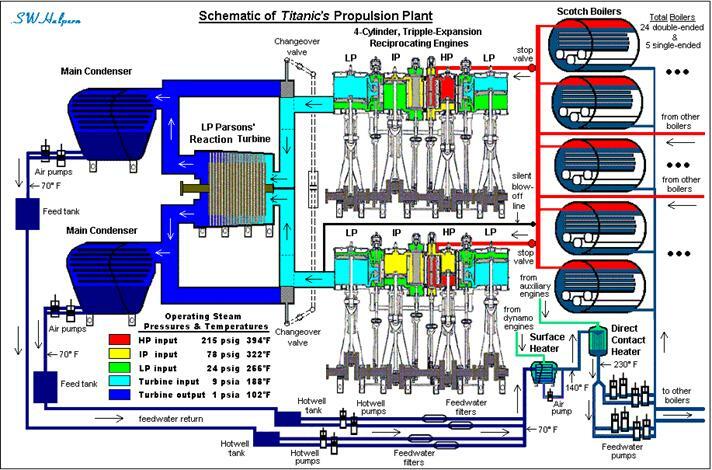 Titanic’s 4-cylinder reciprocating engines were balanced on what was called the Yarrow, Schlick, and Tweedy system. The crank throws were not arranged at 90-degree intervals as one might assume. Instead, vibration was reduced by adjustment of the relative crank angles and crank sequence being used. Beginning with the HP cylinder piston at top dead center (TDC), the crank sequence and angles of the engines were: HP at TDC, then a 106° rotation for the IP to TDC, then a 100° rotation for the forward LP to TDC, then a 54° rotation for the aft LP to TDC, then a 100° rotation for the HP to return to TDC. This crank arrangement is shown in the diagram below. When maneuvering the engines, the engineers would be at the controls on the bottommost platform, called starting platform, located between the two engines near the forward LP cylinder columns. It was their job to control the steam supply and the direction of engine rotation. When entering or leaving port, the chief engineer would also be on the starting platform along with two senior and three junior engineers. The chief engineer would be in the center of the platform, midway between the two reciprocating engines near the two hydraulic reversing engines (called Brown’s engines) watching every movement of the telegraphs, and seeing that all orders were being carried out. The two senior engineers worked the controls for the two engines, and a junior engineer wrote down every order that came down from the bridge and logged the time to the nearest minute off an electric clock that was controlled by a master clock in the chart room on the bridge. Two other junior engineers were there on the starting platform to answer the engine-order telegraphs which were located about 12 feet apart on the forward LP cylinder columns of the engines. To maneuver a triple-expansion steam engine, an engineer would open a throttle valve to regulate the supply steam to the engine. The valves on the cylinders were actuated by means of eccentrics driven by the crankshaft, there being two eccentrics, one for ahead and the other for astern, connected to an expansion link which operated a cylinder valve by way of a connecting rod. This was called a Stephenson arrangement. With the expansion link full over to one side, one of the eccentrics alone, ahead or astern, would actuate the cylinder valve. With the expansion linkage at the middle point, both eccentrics would have equal influence and the cylinder valve would not admit steam for either astern or ahead operation even with the supply valve opened. At intermediate positions of the expansion linkage, steam would be cut off from the cylinder at some intermediate point in the piston stroke allowing steam to expand in the cylinder to achieve maximum economy of steam usage for a desired indicated power output. 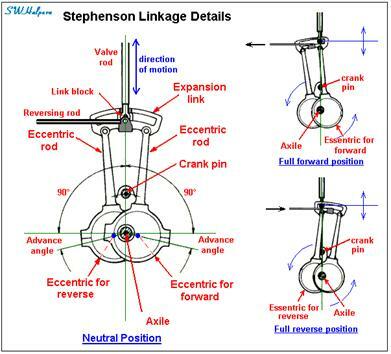 The diagram below shows some of the details behind a typical Stephenson linkage arrangement. 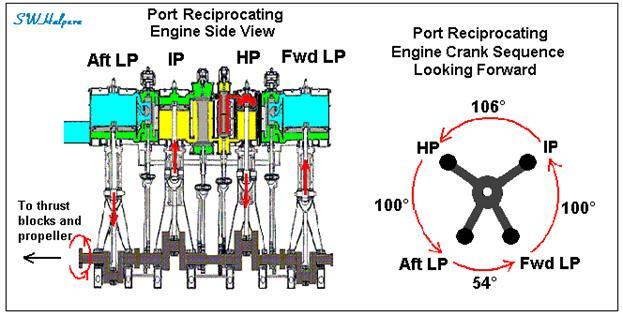 An animation of the motion of this linkage for an intermediate position of the expansion link for ahead operation on the port reciprocating engine’s HP cylinder is shown below. To control the direction of the engine and set the cutoff point, the engineer at the controls would have to move a “reversing” lever that would cause the expansion linkage to move to an ahead or astern position. For large engines such as on the Titanic, a hydraulic cylinder called a Brown’s engine would be used to actually move the linkage. The movement of the linkage would be adjusted to control the desired cutoff point that steam is admitted to the cylinders and thereby set the desired degree of steam expansion within the cylinders. At full ahead speeds, a cutoff point of about 40 to 45% of the piston stroke might be used. In an extreme emergency, it was possible to reverse the engines from full ahead to full astern. However, this was not an instantaneous process. In general, and with the engineers ready at the controls, it would typically take from 10 to 20 seconds from the time the order was received in the engine room for the engines to first come to a stop and first start to reverse their direction of rotation. It then would take another 30 to 50 seconds before the engines would be backing hard. The lifting of the changeover valves to redirect exhaust steam from the reciprocating engines to the condensers directly, thus taking the turbine engine off line, would take only about 10 seconds once the changeover-valve reversing lever was swung over. Both reciprocating engines were also equipped with Aspinall governors that worked with a Brown's engine that controlled the reciprocating engine's throttle valve in case it started to race such as in the case of a propeller partially or completely breaking the surface of the water. It was also designed so that in the cases of really severe racing, such as the dropping of a propeller or a broken shaft, the governor would lock the throttle in the closed position until the engine was stopped. The reciprocating engines were connected to the propeller shafts by way of thrust shafts that contained 14 collars to take up the thrust from the propeller shaft. On each side of these collars were thrust rings in the thrust block that were fixed to the hull of the vessel. The thrust blocks for the reciprocating engines were located just aft of the forward watertight bulkhead in the turbine engine room. There was no throttle control for the turbine engine. The turbine simply responded proportionally to the amount of exhaust steam being received from the reciprocating engines. The changeover valves ahead of the turbine did provide some form of speed control as there was an automatic override whereby the turbine's Proell centrifugal governor actuated the Brown's engine used to operate the two piston changeover valves. If the speed of the turbine rotor exceeded 10% above the maximum number of revolutions dialed in, the changeover valves would redirect steam to the condensers until the speed of the turbine dropped below the preset limit. When the turbine engine was connected up it ran at a rate of about 2.22 times that of the reciprocating engines. According to Olympic’s Senior Second Engineer John Therle, when the reciprocating engines were making 80 revolutions per minute (rpm), the turbine was making between 175 and 180 rpm; and the maximum number of revolutions on the turbine was 190 rpm when the reciprocating engines were run at their highest possible speed. The following diagram shows the relationship between the number of revolutions on the turbine engine to the number of revolutions on the reciprocating engines based on the above. Steam flow through Titanic’s turbine engine is shown in the diagram below. As mentioned before, during maneuvering, going astern, or for speeds less than half-ahead (about 50 revolutions per minute on the reciprocating engines), the turbine engine would be disengaged by actuating the changeover valves. This would redirect steam from the input to the turbine and send it directly to the main condensers. The redirected steam path is shown in the diagram below as dashed lines. The turbine was a direct-coupled type, meaning that its rotor was directly coupled to the propeller shaft without any reduction gearing. It was also a multistage reaction type turbine in which there were alternating rows of fixed blades and moving blades. The moving blades projected radially from the rotor and were mounted so that the spaces between the blades have the shape of nozzles. The rows of fixed blades were of the same shape and also had spaces between the blades with the shape of nozzles. These fixed blades were fastened to the casing in which the rotor revolved. The fixed blades guided the steam into the moving blades. The alternating rows of turbine blading increased in size along the length of the turbine to make full use of the energy of the steam as it expanded while passing through. On the Titanic this amounted to a 42% increase in blade length from the input side of the turbine forward to the output side aft. A simple animation of a reaction turbine is shown below. The reaction turbine is moved essentially by three forces. The first is the reactive force produced on the moving blades as the steam increases in velocity as it expands through the nozzle-shaped spaces between the blades. The second is the reactive force produced on the moving blades when the steam changes direction. And the third force is the push or impulse of the steam impinging upon the blades. The turbine is moved primarily by the first two reactive forces, and only to a lesser extent by the direct impulsive force. The advantage of the turbine was that it could take steam below atmospheric pressure and expand it further down to a pressure just a little above a vacuum. The turbine was very large and rotated relatively slowly, a little over twice the rotational velocity of the reciprocating engines. This allowed it to be directly coupled to the shaft of the central propeller without the need for reduction gearing. The Titanic, as well as her sister ship Olympic, used this hybrid arrangement of combined machinery. The low-pressure reaction turbine was a fourth stage of expansion, extracting every ounce of power from the steam supplied from the boilers. The result was an increase in fuel economy and overall horsepower. A simple animation of the combined propulsion system used on Titanic is shown below. This real-time animation models the operation of the reciprocating and turbine engines closely, including the crank arrangement described above. As a point of comparison, the all-turbine equipped Cunard Line’s Lusitania and Mauretania had a gross tonnage of about 70% that of Titanic. Yet, these two ships required a power plant that produced about 50% more power to drive them at a design speed of only 4 knots faster. That is for a design speed of about 19% above the design speed of Olympic and Titanic, the Lusitania and Mauretania had to generate about 68,000 HP compared to 46,000 HP for Olympic and Titanic, as well as having a corresponding increase in coal consumption. As a specific example, Lusitania on her third transatlantic crossing westbound burned an average of 1,090 tons of coal per day from Queenstown to New York at an average crossing speed of 24.25 knots. Olympic on her maiden voyage burned an average of 629 tons per day during the crossing from Queenstown to New York at an average crossing speed of 21.43 knots. The difference is a 73% higher coal consumption rate on Lusitania for a gain of only 2.8 knots (13%) in average crossing speed for the smaller, all-turbine equipped vessel. Looking at the total coal consumed for the Queenstown to New York crossing, the 31,600 gross-ton Lusitania burned 4,976 tons of coal, while the 45,300 gross-ton Olympic burned only 3,540 tons of coal; a total savings for the larger, hybrid-propulsion equipped vessel of 29%. I would like to thank both Mark Chirnside and Scott Andrews for their consultation and review of this fascinating topic, and the sharing of detailed information and knowledge with me over the past few years. 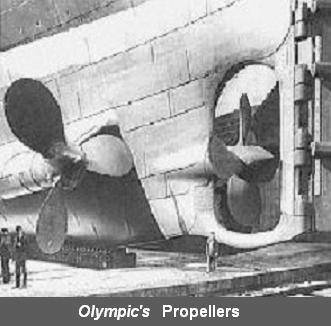 On Olympic the central propeller had 4 blades and was 16.5 ft in diameter. On Titanic the central propeller had 3 blades and was 17.0 ft in diameter. Ref: Mark Chirnside, “The Mystery of Titanic’s Central Propeller,” ET Research paper, Monday, 5 May 2008. It has been estimated by a Professor J. H. Biles during the inquiry into the Hawke collision that at 21 knots, and 46,000 IHP, the resistance of the Olympic would be 165 tons assuming a maximum displacement tonnage of about 53,000. This updated information is from Mark Chirnside. In Mark’s book, The Olympic-Class Ships: Olympic, Titanic, Britannic, (Tempus Publishing, 2004) the horsepower was accidentally printed incorrectly at 56,000 instead of the correct 46,000 for a speed of 21 knots. This information, courtesy of Mark Chirnside, came from Olympic engineers Robert Fleming and Charles McKimm. The High Pressure (HP) cylinder radius was R = 27 inches, and its stroke was L = 75 inches. The total HP cylinder volume was therefore = p R2 L = 171,767 cu-inches. Assuming 42% cutoff for 75 revolutions (based on the ratio of specific volume for saturated steam at pressures of 230 psia input and 93 psia output) we get a steam intake volume equal to V = 0.42 x 171,767 = 72,142 cu inches per stroke on one side of the cylinder. Since the engines were double acting, we get an input flow rate of 2 x 72,142 = 144,284 cu-inches per engine revolution. At a rotational rate of 75 rpm we have an intake rate from the boilers of 75 x 144,284 = 10,821,300 cu-inches of steam per minute per engine. With two engines, we get a total of 10,821,300 x 2 = 21,642,600 cu-inches per minute of steam being supplied by the boilers. To get this in terms of cubic feet per minute we divide this result by 1728 cu-in per cu-ft. Therefore, the input steam supply rate is 21,642,600/1728 = 12,525 cu-ft per minute. The specific volume of saturated steam at 215 psig (229 psia) at the HP cylinder input is 2.0 cu-ft per lbs. (See D. A. Mooney, Mechanical Engineering Thermodynamics, Prentice-Hall, 1953.) Therefore, in terms of boiler supply, we get 12,525/2.0 = 6,262 lbs/minute, or expressed in tons (2240 lbs/long-ton) per minute, we get 6,262/2240 = 2.8 tons of steam per minute being supplied from the 24 double-ended boilers. This is a supply rate of 6,262/24 = 260.9 lbs of steam per minute per boiler. The aftermost funnel was used as a ventilator over the turbine room. The galley flues were vented up this funnel. A 250 ton/hour ballast & bilge pump as well as the ash ejector pump were contained in each of the pump rooms in boiler rooms No. 2, 3, and 5. The ship’s watertight bulkheads were designated “A” through “P.” The letter “I” was not used. Green is the assumed color for the “Half” speed order. The other colors come from the testimony of leading firemen Frederick Barrett. The ship’s steering engines were the only auxiliary steam engines to exhaust directly into the ship’s main condensers. Testimony of Edward Wilding, BI 19827. A more extreme example was the battleship USS Texas which was run at almost 80% cutoff for a full ahead speed of 21 knots. The Texas was equipped with two 4-cylinder, triple-expansion engines. From H. I. Cone, Engineer in Chief U. S. Navy, Chief of Bureau, May 8, 1912. At the time the Titanic collided with an iceberg on the night of April 14, 1912, it was observed that the reciprocating engines did not come to a stop for about 1 to 2 minutes following the collision (trimmer Thomas Dillon). The arms from the Brown’s hydraulic engine that operated the levers of changeover valves in the turbine room were seen to lift about 2 minutes after the collision (greaser Thomas Ranger). This caused the pistons in the changeover valves to lower thereby cutting off the turbine and redirecting the steam to the main condensers. The engines were seen to slowly reverse for a minute or two very shortly after coming to a stop in an apparent effort to take the way off the ship to bring it to a complete stop in the water (Dillon). There is no observational evidence from any eye witness down in the engine rooms to support the notion that a crash stop was ever intended. Just seconds before the collision, a “Stop” order was sent from the engine room to the stokeholds on the boiler room telegraph (leading fireman Frederick Barrett). Mark Chirnside, The Olympic-Class Ships: Olympic, Titanic, Britannic, Tempus Publishing, 2004, p. 72. Gross tonnage is a measure of internal volume of the vessel, not its weight. The displacement of a vessel is a measure of its weight. The power needed in the steam plant to move a ship through the water is approximately proportional to the cube of the speed of the ship. This is because a ship’s drag through the water increases as the square of the speed. The thrust produced by the propellers must also to go up as the square of the speed to overcome this increased drag. Since energy is force times distance, the energy expended per engine cycle must also increase in proportion to the square of the speed of the ship as well. But power is just a measure of the expenditure rate of energy per unit of time. So, if the ship’s speed was to double, say from 11 knots to 22 knots, the energy needed to overcome the increased drag through the water would be 4 times as great, and this energy would have to be expended twice as fast as before. Thus we see that the power, which is the energy expenditure rate, needs to be 8 times greater in order to double a ship’s speed. What is listed here are the design speeds and power requirements. The design speed for the Lusitania was 25 knots; the design speed of the Olympic was 21 knots. J. Kent Layton, Lusitania – An Illustrated Biography of the Ship of Splendor, Lulu Press, 2007. The Olympic burned 3,540 tons of coal on her maiden voyage westbound. The correct crossing time after correcting a 100 minute mistake works out to 135 hours, and the correct average crossing speed works out to 21.43 knots. (See: “Olympic and Titanic – Maiden Voyage Mysteries,” Titanic International Society’s Voyage 59 journal, Spring 2007, by Mark Chirnside and Sam Halpern.) Using the correct crossing time, the consumption rate per 24 hours works out to an average of 629 tons.